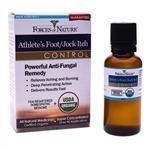 Powerful all-natural anti-fungal medicine to fight jock itch. Results guaranteed. It is important to follow guidelines for athletes foot treatment carefully since the infecting fungus is quite hardy and often very difficult to kill which is why many remedies do not work. Following the course of treatment with a proper antifungal remedy can however ensure eradication of the fungus and help eliminate further recurrence.